Julianne's Stitching Corner: Pac Man Does It Again! We are celebrating the 8th world title of Manny Pacquiao in last night's fight against Margarito. My husband is a big boxing fan and the fact that he is Filipino makes him a HUGE Manny Pacquiao fan. 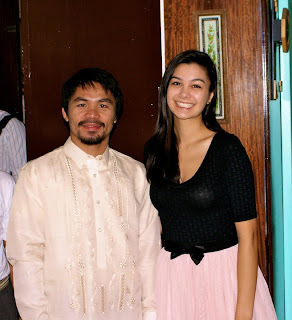 When we were in the Philippines late this summer, we had an opportunity to meet Pacquiao at the founder's day celebration of my husband's alma mater in Dumaguete City on the island of Negros. Andrea was really thrilled to be able to get his autograph and pose with him in a picture. I got to shake his hand. You would definitely not assume that he is a world-class fighter just by looking at him. He is quite small but as showed his opponent last night; looks can be deceiving. Thanks for stopping by. I should have some stitching to share soon. My husband and son follow Pac Man too. They really enjoy watching his matches. Pac Man rocks! And look at sweet Andrea in the picture with him :) She towers over him! :) and looks pretty as a picture!